Go MAD on your mobile with adMAD. This is not a new concept. mGinger has already introduced this concept but adMAD pays you a lot more than mGinger. So, what difference does it makes to us. We just need money which this adMAD provides us. Now, lets take a closer look at the payment which adMAD does to us. You get to earn for 5 levels. Get 15 paise for each SMS your friends recieve. Get 10 paise for each SMS their friends recieve. 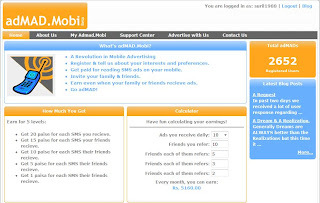 Get 5 paise for each SMS their friends recieve. Get 1 paisa for each SMS their friends recieve. So, just sign up through this adMAD and start earning.